Another year, another set of Oscar nominees, and once again, we find an overwhelmingly homogeneous set of potential award winners. 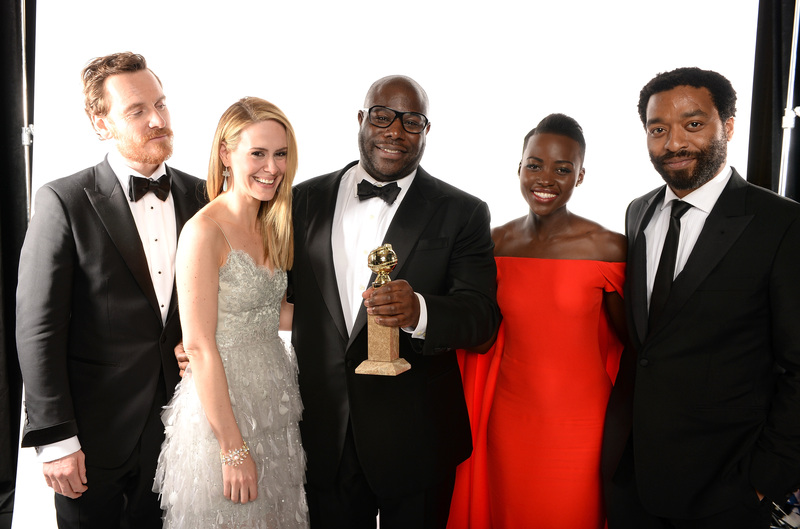 Despite the presences of major contender 12 Years a Slave in the nomination pool, for the most part, the 2014 Academy Award nominations are business as usual, meaning most non-actress categories are filled to the brim with men and every category is largely filled with white nominees. The truly sad part is that this development isn't even slightly surprising. Yes, 12 Years a Slave is responsible for the nominations of two incredible actors, Chiwetel Ejiofor and Lupita Nyong'o, and Captain Phillips delivered Barkhad Abdi to nomination success. And yes, two men in the Best Director category would satisfy most definitions of diversity — Gravity director Alfonso Cuaron (from Mexico City) and 12 Years a Slave's Steve McQueen. But is that enough? Can we stick a fork in it and call it diversity? Are we supposed to see five non-white nominations and think that suddenly it's all okay now? The answer you're looking for is "no." We're not. While some could argue that black actors like Michael B. Jordan (Fruitvale Station) or Forrest Whitaker and Oprah Winfrey (The Butler) were snubbed, there is the factor of release timing that could have helped doom those performances come nomination time — Fruitvale came out in January of 2013 and The Butler was released in August. Then there's Mandela: A Long Walk to Freedom, which saw the incredible Idris Elba nominated for a Globe, but saw rather middling reviews, which is likely why it's missing from the Oscar lineup. On the gender diversity scale, there's almost none, per usual, in the top film-making categories: director, screenplay, adapted screenplay. Julie Delpy and Melisa Wallack are part of nominated screenwriting teams, but no one woman stands on her own. The full-length documentary category gets an unlikely boost from Jehane Noujaim (The Square) as well as Christine Cynn (part of a team of filmmakers on The Act of Killing). But where energy and fervor for a more diverse Hollywood bloomed when Kathryn Bigelow became the first woman to win Best Director in 2010 (The Hurt Locker), when Ang Lee became the first Asian director to win an Oscar in 2005 (Brokeback Mountain), and when Halle Berry became the first black actress to win an Oscar in 2001 (Monster's Ball), there seems to be very little actual change. And in some regard, that has to do with the available "Oscar contenders." There's a very deliberate way in which films are presented as Oscar-worthy. They're released at a certain time of year (somewhere between November 1 and Christmas Day), they're promoted as awards season films, and often, they have at least one major star involved whether that star is the director (Nebraska's Alexander Payne) or the supporting cast (Brad Pitt and Michael Fassbender in 12 Years a Slave), they have some shiny object tied to them to make each film memorable enough to garner standing with the Academy voters. The lack of diversity isn't just in the set of Oscar nominations, it's in the set of "Oscar-worthy films" determined by the film release schedule and studio marketing teams. It's also determined by the straight-up lack of diversity throughout mainstream film. Sure, you could argue that 2013 saw great direction from women like Lake Bell (In A World), Sofia Coppola (The Bling Ring), Nicole Holofcener (Enough Said), and Gabriela Cowperthwaite (Blackfish). With the exception of Blackfish (a film some consider an Oscar snub), we find three indie movies largely lending themselves to the comedy genre — not a frequent favorite of Oscar voters unless that comedy was directed by golden boy David O. Russell. The industry simply doesn't employ a large selection of women in directing and screenwriting roles, so where are the nominees supposed to come from? And with regard to racial diversity, you'd be hard-pressed to find any film released and marketed on a grand enough scale to merit Oscar attention — aside from 12 Years a Slave and the snubbed Butler — that even stood a chance of having its voice heard over the roar of The Wolf of Wall Street and American Hustle. What it all boils down to is that the industry doesn't make much room for diversity among its top stars and top talent, so what chance does the biggest award ceremony of the year have to change that?